Computer paradigms can shift as swiftly as cloud formations in the blue sky on a windy day. Cloud computing is a recent trend forecast for the future of healthcare informatics. The term sounds nebulous, but the application is concrete. For folks who don’t speak technoparlance, cloud refers to the Internet, and cloud computing fosters better access and digital data storage. Everything that was once accomplished on a workstation and local or wide area network is achievable via the vast collection of Internet-based and accessible linkages—the cloud. While cloud computing may seem like network computing, a wide expanse of sky separates the two. Networking involves a single entity and its servers. Cloud computing encompasses multiple organizations and their servers connected via the Internet to build a more extensive network that can facilitate potentially universal accessibility. The concept has significant implications for medical imaging and healthcare in general. Cloud computing enables wider sharing (sending and receiving), storage, access, and manipulation of data, which can be achieved in a cost-effective, secure, and user-friendly fashion. Companies have been offering cloud-based services such as archiving and off-site backup for years. The off-site PACS archives that many firms offer are one example. A new wrinkle unveiled at RSNA 2009 was using cloud-based services to move healthcare information between organizations—an approach to meeting the interoperability objective. 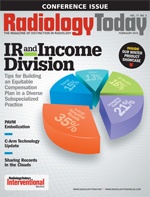 “Without having to make significant capital investments in hardware, users can securely transfer and track information via standardized, Internet-based tools,” says Murray Reicher, MD, a radiologist and the chairman of San Diego-based DR Systems, a company that lassoed the cloud to produce its eMix solution for sharing images and information to diverse facilities and organizations. (The name eMix is shorthand for electronic medical information exchange.) DR Systems is one of two companies—the other is lifeIMAGE—that recently introduced cloud-based record-sharing products. DR Systems unveiled eMix at RSNA 2009. The vendor-neutral system addresses problems typically encountered by hospitals, imaging centers, referring physicians, and patients in sharing records and images. Using eMix enables secure, Internet-based data sharing among disparate institutions and physicians, and it facilitates the inclusion of patient images into EMRs and patients’ personal health records. The data it handles include images, reports, and documents. Basically it addresses the interoperability question by inserting a cloud computing layer to which one facility can upload images and data in formats that others can download and read and import into their own systems. “Cloud computing technology is changing the rules by enabling transfer of medical images and associated information as easily as sending an e-mail,” says Reicher. Essentially, this is how eMix works: A sender selects an exam from a worklist, prepares any relevant document for packaging with the exam, selects the recipients, and then uploads the exam components to the eMix Web server. In turn, recipients receive an e-mail notification. After logging in as a new or existing user, recipients download the package and work with it accordingly. They can send it to a PACS, view it via the eMix viewer, or burn it to a CD. But eMix is also helping eliminate methods such as CD burning, as well as film printing and report faxing. But DR Systems offered a cloud-based solution that required no capital outlay. Further, the solution could even provide a revenue-generating opportunity. IMOM was convinced, and it began rolling out eMix in late November 2009 at three participating beta sites: Kalispell, Great Falls Clinic, and Saint Luke Community Healthcare. Because aspects of cloud computing act and feel like e-mail, Reicher concedes security is a major concern, especially among the uninitiated: the patients. “I wouldn’t like my medical records going up into a ‘cloud,’ which implies something that’s not very secure,” he says. To address that, DR Systems’ HIPAA-compliant solution integrates eight layers of security. The foundation layer involves physical infrastructure and data housing. “We have a very secure facility in Sorrento Valley, Calif., that we’ll later supplement with a secondary data center located in the Heartland,” Saint-Clair says. The company reports that its existing data center is accessible only to a limited number of authorized personnel who require biometric authentication. “Our CEO can’t even get into it,” Saint-Clair says. Further, data center protection is provided by redundant and emergency backup power and multiple redundant backbone connections to the Internet. The next layer involves network access security via multiple layers of attack-preventing firewalls and intrusion detection. Other security layers include member verification and user authentication; 128-bit TLS encryption, which ensures that data in transit are indecipherable to nonauthorized users; secure sockets layer data transmission, a standard security protocol that protects information from unauthorized access; and auditing that tracks all transactions. “The eMix security policy would still be quite effective with one or two less layers, but that’s not a compromise we’re willing to make. Most likely, our security policy will only expand,” says Saint-Clair. Massachusetts-based lifeIMAGE also introduced its new cloud-based service at RSNA. Like DR Systems, the company recently launched its service in late 2009. The company was founded by Hamid Tabatabaie and Amy Vreeland, who were previously the CEO and vice president, respectively, of PACS company AMICAS. The company’s open and flexible architecture supports multiple browsers on Macs and PCs. Users only need the browser-of-choice and Adobe’s Flash Player. The system includes a universal imaging inbox. As the name implies, this component enables secure collecting, viewing, and sharing of imaging cases among facilities and physicians located anywhere via Internet connection. The initial service offering also includes the enterprise version of its lifeIMAGE Local Appliance (lila) software that enables physicians to manage the increasing volume of incoming patient CDs. They can easily review and share images with colleagues. The lifeIMAGE solution seeks to offer a more effective way to access and aggregate medical images, regardless of when and where those studies were performed. The solution also reduces exam redundancy. “Redundancy typically occurs when you don’t have access to a patient’s prior exams,” Tabatabaie points out, adding that it’s widespread and expensive. Between 10% and 15% of annual imaging exams are repeat exams, and the amount translates into an unnecessary $15 billion expenditure. Tabatabaie also notes that eliminating redundant exams cuts down on patients’ radiation exposure, a sensitive issue in medical imaging today. Also, lifeIMAGE’s cloud-based capabilities and personal universal inbox can provide patients with greater ownership of their health information by collecting all of their imaging records in one place. This could represent a major step forward in educating the healthcare consumer. “They’re probably the least educated consumer out there, and the lifeIMAGE technology places the personal health record into their hands, which is where it belongs,” Weschler says. It could also impact PACS. “Until now, PACS has done a phenomenal job in creating on-ramps from imaging modalities in hospitals and imaging centers, but it hasn’t done a great job for smaller operations, and it hasn’t solved the extramural transfer of medical records and results in scalable and confidential manner,” he says. Cloud computing should help resolve such issues. And while cloud-based technology such as the eMix and lifeIMAGE solutions foster patient-directed medical records and a team approach to healthcare that connects caregivers, it represents a potential international solution. “Institutions interested in developing international programs of care will be able to move records in a very efficient and cost-effective manner,” he adds.